As a boy in Trinidad I spent weekends in Carapichaima, a town with a population of predominantly East Indian descendants. Close by were the villages of Bamboo Settlement, Waterloo, Freeport, Felicity and the town of Chaguanas (where Vidia Naipaul was born), all on the Caroni plain, a very East Indian community. The older East Indian Hindus of Trinidad still wore their traditional clothes of saris and kurta dhotis. They spoke several Indian dialects, attended the mandir and sang bhajans or more recently, chutney. They carried Indian names: Sookram, Vishnu, Ganesh, Indra and Asha. They celebrated Divali and Phagwa. The younger ones knew of the caste system but generally disregarded it. Their main foods were rice and vegetable curry and the popular roti loved by all Trinidadians. These villages were very different to other Trinidadian villages like Lopinot or Paramin, both very Panyol (Espanol or Spanish). In Chaguanas, there is the crowded market where almost everyone is of East Indian descent, the air carries the scent of curry and spices and the blaring music from the shops are in Hindi and probably by Lata Mangeshkar. It seemed very Indian. Yet, walking in a village in Rajasthan is not the same. Unexplicably, a Rajasthani village (which has perhaps a total of three television sets) feels less alien than Freeport. Perhaps back in Trinidad I had no context in which to place our TrIndian culture. When I told a Bombay shop manager that almost half of our ountry was East Indian she replied, "Yes, but if they left 150 years ago they will be a pocket of an Indian culture from a bygone time." Ironically, Bombay was the only place in India where I suffered intense culture shock. Somewhere along the line, the two lines of the same family diverged. The East Indians in Trinidad came from as early as 1845 bringing with them a culture that existed 100 years before the Independence of India and the birth of Pakistan. The Trinidadian line subtly merged with Trinidadian cultures as evidenced by chutney-soca music and the not-so-few mixed marriages. The Indian line went on to win a bloody Independence from an oppressive Britain and struggle on with an overwhelming population toward modernisation. Interestingly, the Trinidadian Chinese have a similar history but whereas we have been totally assimilated into western culture my ancestral village in China has remained in a time capsule. The city of Udaipur in Rajasthan, western India, is surrounded by several villages built around temples or historic sites. The roads out to these villages pass through dry, almost desert, land, with a few goats and low stone walls to betray human habitation. From time to time the bus stops in small villages of untidy shops and small ragged children with lovely eyes and outstretched hands. Beside the traditional clothes of saris and kurta dhotis with turbans, the men also wear earrings and the women noserings. Several villagers are dressed as though they have been to the city for a visit. A few carry large bags and packages, an electric fan, a bag heavy as with grain, a plastic clothes closet, a small suitcase. 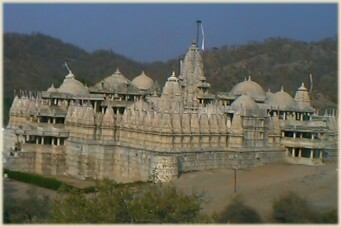 The Chaturmukha Jain Temple of Rishabhadeva at Ranakpur lies in the secluded valley of Mount Madri. 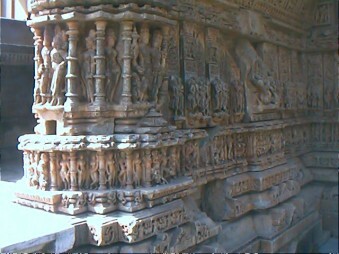 It is a major Jain architectural achievement and an exquisite work of art equal to, but less famous than, the Taj Mahal. It was begun in 1446 of the Vikram Era (1390 CE) and took more than 50 years to complete. The walls, ceilings, domes, pillars and doorways are finely and elaborately sculpted - the sculptors were said to be paid according to the amount of marble they chiseled away – and the finished temple in natural marble looks like an ornate carving from a single piece of stone. Every sculptor says: "Sculpting is merely chipping away the stone to reveal what was always waiting there inside." The eyes of the 84 statues of past tirthankaras ("those who have crossed the ocean of becoming") are fixed and unrealistically striking. The Jains know that an idol is not a god but it is believed that a god's energy can flow through the eyes of the idol to the believer which is why the third eye is always anointed. Sitting on the temple's wide balcony seats in the afternoon sun I can feel a rightness to the temple, like pi or the Golden Ratio of geometry. A Jain monk in cream and white anoints the statue of Shiva with yellow sandalwood paste. A temple monkey swings up from the ground to sit beside me on the low wall, oblivious of the many tourists wandering through. Sanjay and I eat a simple vegetarian meal at the Temple's dharamshala: dal soup, naan, vegetable curry, rice and water. Like fellow devotees, birds fly in to peck at the crumbs on the tables. Jainism is a radical religion founded 2500 years ago by Prince Vardhamana. 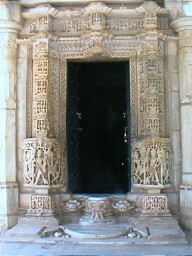 Like the Buddhists, they believe in the liberation of the soul and revere their great teachers including the Buddha and the gate at Ranakpur resembles those of Tibetan Buddhist temples with the deer on either side of the wheel of life. The most orthodox monks and nuns take the basic precept (all life is considered sacred) to an extreme by wearing a net over their noses and mouths to avoid inhaling any insects by accident and sweep the path in front of them while walking so as not to step on an insect. 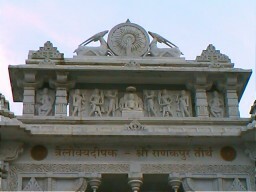 The Shvetambara sect wear white while the Digambara sect go unclothed. But not all Jains are this colourful. At Ranakpur, most of the Jains look like Hindus except that the women wear white, usually a sign of widowhood in Indian culture. Descended from the same line of Persian Zoroastrians like the Parsees who also reject the caste system, all Jains take vows not to lie, steal, nor own more than they need. Due to their respect for life they are forbidden to hunt, fish, farm or fight. They thus become, paradoxically, very charitable bankers, businessmen and moneylenders. There are only 2 million Jains in India today. The Shiva Temple is the main attraction of the jumbled village of Eklingji especially during the Maha Shivaratri Festival when hundreds of Hindus walk the 22 km from Udaipur on pilgrimage. The week after the festival the pilgrims have gone and life has returned to its leisurely pace. We buy two Pepsi Colas from a shop where the local men sit playing draughts and a mala (rosary) from one of the many puja stalls outside the Temple. I walk through the compound of small incense-burning temples and find even the solid silver bull uninspiring. 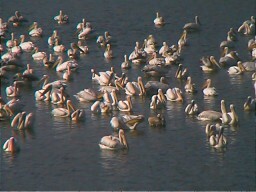 The nearby Nagda is, however, a wonderful surprise. Two kilometers away along a winding dirt road we pass a shepherd with his goats and a lake where a flock of pelicans casually float peering for fish and where women wash clothes on the ghats. One thousand years ago, Nagda was the capital of the Mewar region of southern Rajasthan. Today, Nagda is a forgotten village of few buildings, pretty fields and Saas Bahu. Saas Bahu, the Hindu temple complex now being restored, is as stunning as the Jain temples at Ranakpur in its architectural simplicity and intricate carvings. Unused for decades and devoid of statues in its shrines, it looks like a desolate ruin and even the village people do not pass this way. 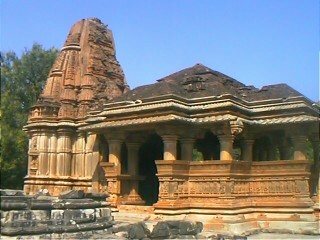 Other Hindu temples outside the village of Nagda also lie derelict and abandoned. Like ghost houses of the holy, their shells radiate an aura of spirituality impregnated in the stones. 'Hindu' is a term coined by Alexander the Great for the peoples on the other side of the Indus River. These people call their country Bharath and their religion Sanatan Dharma or Eternal Faith. The ancient civilisations of Harrapa and Mohenjo Daro passed away around 1800 BC and were succeeded 300 years later by the Aryan race from Central Asia who brought with them their Sanskrit language, their Vedic religion and their class system which later became the caste system. Their holy books the Vedas, the Upanishads, the Ramayana and the Mahabharata are still studied today, as the basis of Hinduism, in the original Sanskrit. Toward the end of their cycle 1200 years later, there was a general reaction to their Brahminical religion resulting in the birth of Jainism and Buddhism. The neo-Nazi Aryans worldwide can note that the present day Hindus are closer to the ancient Aryans than any other race. The Aryans were succeeded by a series of rulers from within India: the Mauryas, the Shakas and Kushanas, the Guptas and the Cholas. The Rajputs were a small group of warriors from outside India who settled in small kingdoms in Rajasthan and adopted the Indian caste system and culture. Waiting for any kind of transportation on a hot dusty road on a hot spring day 17 kilometers from Haldigathi, we are beckoned over by an old man in an old house. He takes my right hand and looks quickly at what lies in the lines. "You will live to be eighty-five," he says. "You will have good health until then." I try to give him a couple rupees for his kind words but he staunchly refuses them. I leave the coins on a stone bench just as a truck stops for us in a cloud of dust. Haldigathi was the scene of a heroic battle fought in 1576 CE between the Rajput Maharana Pratap of Mewar and the Mughal Emperor Akbar in the valley and the mountain passes. The only surviving monument today is a shrine to Maharana Pratap's horse Chetak which, despite fatal wounds, took the Maharana to safety before succumbing. A brand new fort is being erected on the hilltop from where we can see the battlefield of the whole valley and the surrounding hills. Three brightly decorated dromedaries with their drivers await tourist passengers to Balicha, the village of the semi-nomadic Rabaris, and Molela, the village famous for its terracotta craft. 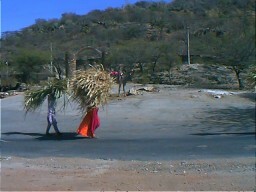 Three women and one man carrying massive stacks of grass on their heads walk by in the midday sun.